Remember that hot spell we had about a week ago? Everyone was thrilled. They went outside. They gardened. They barbecued. Well, I did all of those things, too, but instead of being completely thrilled, I worried. I worried about fruit coming out too early and being destroyed by below-freezing weather. I worried about leaves sprouting on trees, and then a thick, wet, heavy snow coming along and breaking limbs and power lines. I worried that my favorite flowers, daffodils, would be smashed by snow or burned by heat. Or both. I continue to worry that this summer will be unbearably hot, and that we’ll have tornadoes and thunderstorms. Or drought and wildfires. I worry that crops will fail, farmers will suffer, and food prices will rise. Or we won’t be able to buy local produce. Did you ever notice how much better fruits and vegetables taste when they haven’t been picked unripe and transported great distances? I worry about my friends Opal, and Edna and about Haylee and her best friend Willow, especially when they try to solve a murder. They say that’s all over, and there won’t be any more murders to investigate, but I worry. What if they get themselves into danger again? Okay, you’re right. I worry too much. From my baby photos, it’s clear that I was born with worry wrinkles. And worrying does no good. Worrying hasn’t prevented devastating things from happening to people I love. Worrying also hasn’t caused the beautiful weather that I truly do enjoy, even though I may sound like I don’t. I find I can put all my worries on hold when I work with fabrics and teach quilting. Or at least I’m focusing my worries on something useful—designing, cutting, piecing and top-stitching. What about you? Are you one of those people who trots happily through life, or do you have to find ways to keep yourself from having too many concerns? What do you do to distract yourself? 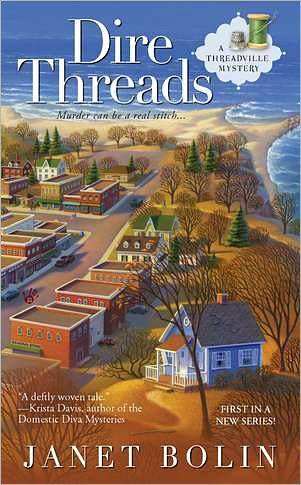 You can learn more about Naomi and how she helped her friends solve a murder in DIRE THREADS, nominated for an Agatha Award for Best First novel, and available in stores everywhere. 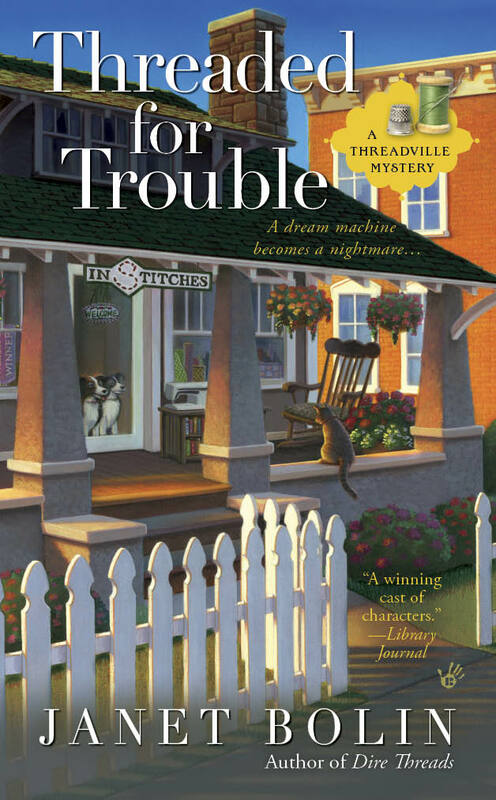 And watch for THREADED FOR TROUBLE, arriving in stores June 5, and available for pre-order now! You're right, Kari. Edna, Opal, and I have supper together nearly every night, including a glass of red wine, and my worries do seem to evaporate. The problem with a good book, though, is I worry about the characters . . .
You want something to worry about? Try having a murder charge hanging in the balance. On second thought, don't try that. It's not much fun and shoots that worry meter right off the charts. Just have a glass of sweet tea, dear! You can imagine how worried I was when Willow was suspected of murder! 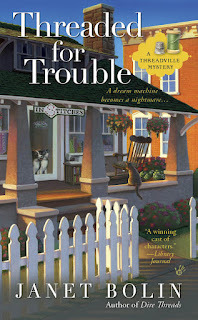 I hope that nothing like that ever happens again in Threadville. Naomi, you'd better stock up on fabric and have a lot of projects planned. I do, but I'll do more! Quilters put the pieces back together. I used to be a worrier, but I'm trying to quit! LOL. Worry is like this vicious loop that you get caught up in, and it doesn't do any good. Don't worry, as the song says, be happy. I sometimes worry about things and then I think of positive solutions and I'm very happy when my worry is for nothing.